The eighth series was completed by late morning. It had been very difficult and and a number of causalities were apparent. Several had handled on two birds while others had now handled in two series. The "body count" callbacks listed only 20 remaining for the ninth. Thirteen had been lost to the Quad. Those dropped were: 1, 5, 15, 26, 41, 42, 52, 54, 58, 60, 61, 83, and 87. The entourage moved back to the LeGrande ranch for the ninth series, a water triple with a retired boat bird. The triple was in the grassy pond were the fourth series water blind was held. The line was set on the side of a steep hill (So steep that a "shelf " had been shoveled out for the line.) The farthest bird (ret.) was approx. 180 yards, the other only about 85 yds. All were dead ducks thrown angled back to the right. 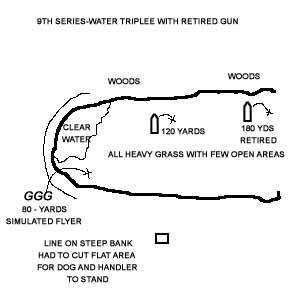 The simulated flyer guns stood on the road at the bottom of the hill, while the other two were in boats. The farthest boat retired as the dog recovered the first bird. After completion, unfortunately a few more dogs were lost. They were: 4, 28, 69, 85, and 89. Sadly, Decker was among them. By mid afternoon the tension was building and there was speculation about a winner within the remaining 15 contenders . The entourage moved again within the ranch for the tenth, a land triple with two flyers and a retired gun. 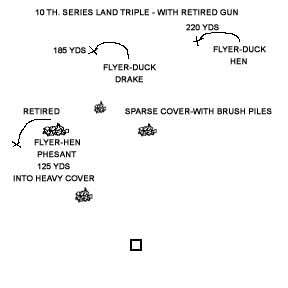 The two shot flyers were ducks while the retired bird was a dead pheasant. The left mark was approx. 175 yds, the center 200 yds and the right one 180 yards. As each dog arrived on line, Dean Ellis announced their names, titles and owner(s)/ handler.